IABM announced the winners of its annual awards at the IABM Annual International Business Conference which took place in London on 1st and 2nd December 2016. 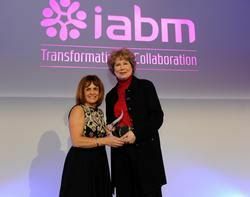 The awards recognize outstanding achievement in four key areas of the broadcast and media technology industry which IABM regards as key to its ongoing health and success. A fifth award – Honorary Membership of IABM - is made to an individual who has played a major role in the development of the industry and contributed to the advancement of IABM over the course of their career. Suzanne Dolan is the driving force behind UK serial drama EastEnders’ engagement with sustainability, culminating in the show being awarded a 3-star rating on the Albert certification scheme for sustainable production. As one of the most widely watched programs on BBC Television, the sustainability badge that now appears on the end credits of the program is hugely influential. “For EastEnders, Suzanne has organised Carbon Literacy training to get department heads and staff informed and motivated; set up a sustainability steering group; overseen projects in Elstree which include installation of low energy studio lighting in studios saving 90,000kWh per year; cut paper use by 50% across scripts/documents; reduced DVD waste and road emissions by cutting DVD rushes; recycled props, costumes, sets, paint and paste pots. Suzanne’s positive attitude and absolute determination make her a very worthy winner of this award,” said John Ive, IABM Director of Technology and Innovation. BAI Communications has successfully introduced a renewable energy Solar PV solution at its Muswellbrook transmission site in NSW, Australia. The trial project has proven reliable in taking this remote site off the grid while continuing to deliver high quality broadcasting, radio, and critical emergency services for over 50,000 end users within a 500km radius. “This successful trial has given BAI Communications the confidence to further pursue its quest to become a carbon neutral organization, and a leader in delivering energy efficient services within the broadcasting industry: just the right credentials to win the award for excellence in sustainability,” said John Ive. Ole Clausen is the personification of the successful serial entrepreneur. After graduating in 1972, he immediately set up his first company, CCTV-Corporation A/S. In 1981, Clausen then established the Danmon Group and set about building it out across the Nordic region throughout the 1980s. In the 1990s, Clausen led Danmon Group into Nordic partnerships with Avid and Philips BTS, and since has led a series of successful acquisitions and start-ups.